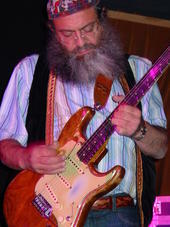 Guitarist Yosi Piamenta is a truly unique musician, and is a beloved fixture of the New York City music scene. Yosi’s performances seamlessly deliver a frenetic fusion of Middle Eastern scales, classic rock riffs, and soulful blues. While critics have compared Piamenta’s fret magic to the likes of Jimi Hendrix, Jerry Garcia, and Carlos Santana, Yosi’s style is truly his own. A listening experience you won’t soon forget.